A student loan and financial aid application. With the price of a college education increasing every year, finding ways to pay for higher education has never become more important. In the United States, one of the best sources for helping you pay for college is the Free Application for Federal Student Aid, or FAFSA. The FAFSA form allows schools to examine the financial position of a potential student, and use that data to determine the amount of money available to them to help pay for school. Filling out the form is the first step in receiving state, federal, and school specific funding for college. It tells each school how much money to allot to for loans, grants, and even scholarships. FAFSA applications can be filled out online or in hard copy, available from any college financial aid office. To fill out the application, the student will need tax information from the previous years, as well as their parents' tax information, if under the age of 24. Some colleges have limited funding for financial aid, so submitting the form as early as possible may have an advantage. Regardless, most schools set deadlines for their financial aid process to help their students determine when to submit their FAFSA. Once the application is complete, a mathematical equation is used to determine the student's expected family contribution, or EFC. This number tells the school how much the student, together with their family, can afford to invest on their own. The lower the EFC, the more aid the student will qualify for. The higher your EFC, the greater chance the student will not qualify for certain types of aid, such as grants. Once the EFC has been calculated, each school uses the EFC to determine the grants, scholarships, and loans that the student qualifies for. Grants are state and federal allocations of money that the student does not need to pay back. 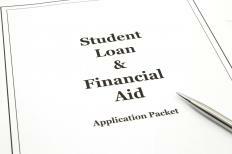 Federal loans are also determined by FAFSA, but will have to be paid back. However, federal loans are usually allocated at a much lower interest rate than private loans for college. Finally, the information may also be used to determine private scholarships and college scholarships available from the specific college the student wishes to attend. The FAFSA is only good for one year of school. Once the school year comes to a close, the student will have to fill out a renewal FAFSA. The renewal FAFSA allows the student to only have to input any new financial tax data, without having to fill out the rest of the form. The amount of aid will vary depending on how much money both the student and their family made the previous year. Financial aid offers may also vary once the student turns 24, as at that point they are considered independent from their parents. This qualifies them for larger amounts of money in federal loan, and may also qualify students for aid who would not otherwise qualify because their parents made too much money. How Do I Determine My Financial Aid Status? What are Higher Education Grants? What is the Expected Family Contribution? How can I get Help with my Federal Financial Aid Application? What is a Student Profile? What are the Different Types of Government Financial Aid?